Having driven by Ronnie’s Diner and read the 200+ glowing Yelp reviews, I thought I would sneak in to check out what I hoped would be a DDD-type place in our backyard. The place has a lot of things going for it. 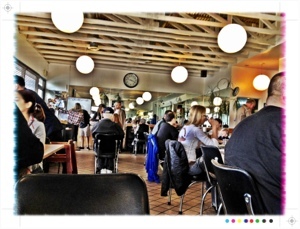 It was jam packed for a weekend brunch, with people standing around waiting for a table to open up. 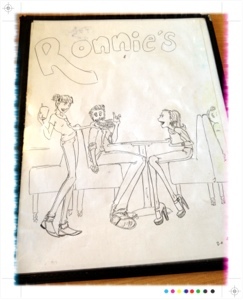 It had these menus with a cover drawn (presumably) by the owner’s 5 year old kid. 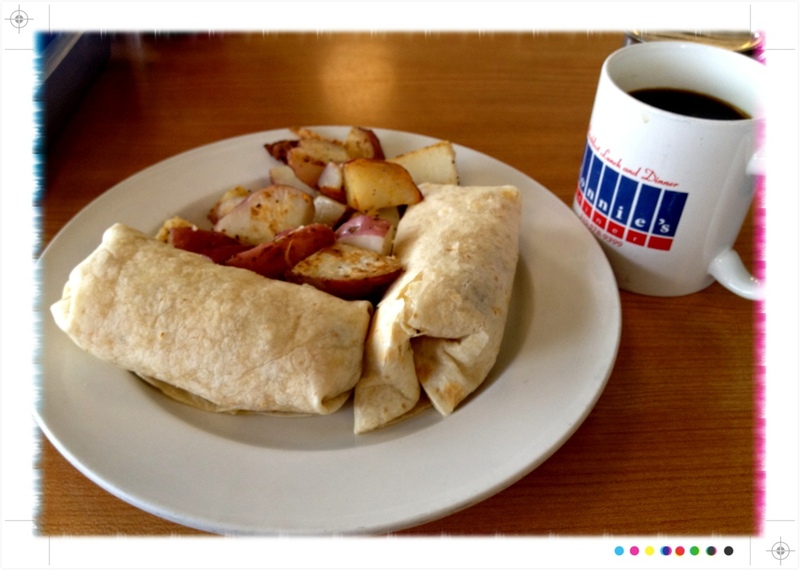 The place was down home, but not in the ersatz way places in West LA can be (like S&W Country Diner in Culver City). The clientele was diverse ethnically, generationally, and in terms of senses of what decade they were living in. Could this be the last un-gentrified space in all of the 310(/424)? Well, if the food is any indication, the gentry are going to stay away for another generation. Ugh, what a fooddouchey thing to say. But the food was mediocre. It didn’t taste bad, it was just forgettable, plain, and not worth waiting a minute for. 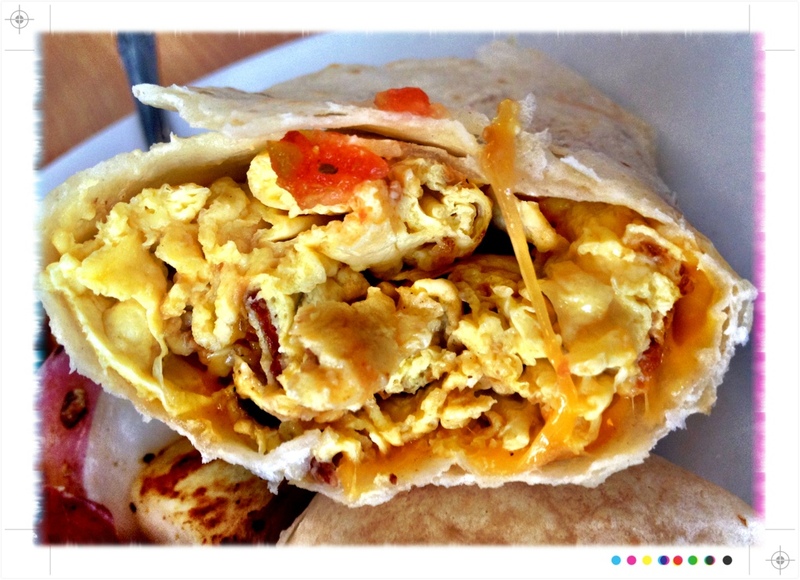 This breakfast burrito, which at least a dozen Yelpers said was great, is all egg with just a little bit of plain yellow cheese and probably one slice of bacon for the whole thing. The potatoes on the side should have been stuffed inside. And the store-bought salsa in a jar on the table should have been stuffed inside, too. It’s not just that anyone could have made this themselves at home; it’s that having an almost all-egg burrito is not my idea of something I would think to want in a non-special-diet scenario. That being said, it was cheap and fast, so maybe I just need to dial back my expectations. It reminds me a little of the now-defunct Tokyo 7-7 in Culver City, minus the old Japanese ladies. It’s just that I don’t sit down for a hot breakfast everyday, so I’m not looking for a place that does mediocre food cheap and fast. I want food I actually think tastes good, and if it costs more than $7, so be it. 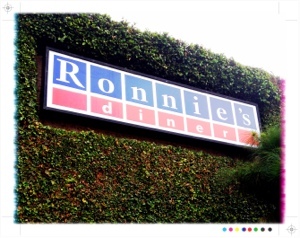 So under that rubric, Ronnie’s is not for me.